These Orange and Sultana Muffins are easy to make – and eat! Both regular and Thermomix instructions included. For an easy recipe to make with the kids, you really can’t go past these Orange and Sultana Muffins. This is an updated version of the Orange and Sultana Muffins recipe I shared YEARS ago, which was well over due for some new photos to be taken – and Thermomix instructions to be included too of course! This is a really simple recipe to put together and there are lots of easy jobs for the kids to help you with along the way. This recipe will make approximately 12 muffins, however you can also use a mini muffin tray to help the recipe go further, just make sure you adjust your cooking time accordingly. 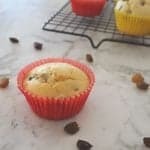 You can also choose to use either bottled or fresh orange juice when making these muffins, I often go between the two depending on what we have in the fridge and pantry! As well as being a yummy snack, these Orange and Sultana Muffins are also great for the kids lunchboxes (especially as they are freezer friendly) or even as a party food. You can find more easy lunchbox recipes for the kids here, and make sure you also check out our Lunchbox Snacks books and ebooks here. These easy Orange and Sultana Muffins make a great lunchbox snack, they are freezer friendly and Thermomix instructions also included. In the bowl of an electric mixer, add the butter, caster sugar, flour, eggs, vanilla extract and orange juice and beat on a low speed for 2 minutes or until just combined before increasing the speed to high and mixing for a further 1 minute. Remove the bowl from the mixer stand and add the sultanas and mix through with a spatula. Spoon the mixture into the paper cases, filling until they are approximately ⅔ full. Place the muffin tray into your preheated oven and bake for 18 - 20 minutes or until cooked when tested with a skewer. Allow the muffins to cool in the trays for 5 minutes before transferring to a wire rack to cool completely. These Muffins can be frozen. These easy Thermomix Orange and Sultana Muffins make a great lunchbox snack, they are freezer friendly and Thermomix instructions also included. Place the softened butter, caster sugar, self-raising flour, orange juice, eggs and vanilla extract into your Thermomix bowl and mix for 10 seconds, speed 5. Scrape down the sides of the bowl and mix for a further 10 seconds, speed 4 or until the mixture is smooth. Remove your Thermomix bowl from the machine and add the sultanas, stir them through with your spatula before filling the muffin cases you prepared earlier until they are 2/3 filled. Place the muffin trays into your pre-heated oven and bake for 18 - 20 minutes or until cooked when tested with a skewer. Allow the cakes to cool in the tins for 5 minutes before carefully transferring to a wire rack to cool completely.